Outlook 2019 helps you manage your tasks. Everyone’s busy. However, the big difference between busy, efficient people and overwhelmed people is that busy people simply know how to manage their tasks so they get things done. This is where Outlook comes into play. To help you manage your tasks, Outlook lets you store your most important tasks and assign due dates and priorities. Now at a glance, Outlook lets you see what’s most important for you to focus on. By spending more of your time on important tasks and less of your time on trivial matters, you’ll become more efficient (provided you actually do the work you’re supposed to be doing). Check here to find out what’s new in Outlook 2019. A goal is simply a dream with a deadline. When storing tasks in Outlook, you need to define what it is that you want to do and set a date for when you want to complete it. Click the Tasks icon in the bottom-left corner of the Outlook window. Outlook displays the Tasks view. Type a new task in this window. If you just need to store a quick task, click in the Type a New Task text box in the middle pane, type a brief description of your task, and press Enter. Click the Home tab. In the New group, click the New Tasks icon. Outlook displays the Task window. The Task window lets you jot down information about your important tasks. Click in the Subject text box and type a brief description of your task, such as Sell produce to my neighbor or Meet with informant. (Optional) Click in the Start Date list box and click a date to start your task. Then click in the Due Date list box and click a date when you want to complete that task. You don’t have to add a start and end date, but it’s a good idea to do so to help you measure your progress (or lack of progress). (Optional) Click in the Status list box and choose an option, such as In Progress or Waiting On Someone Else. (Optional) Click in the Priority list box and choose an option, such as Low or High. (Optional) To define what percentage or the task you’ve completed, click in the % Complete box and click the up or down arrow. Click in the big text box and describe more details about your task. Outlook displays a list of tasks. If you double-click a task, you can open the Tasks window so you can edit or add information to your chosen task. If you have a lot of tasks, you may want to find a particular one. To find an Outlook task, you can search for it. If you know you want to find a task involving, say, chemicals, you can just search for chemicals and Outlook will display that task right away. 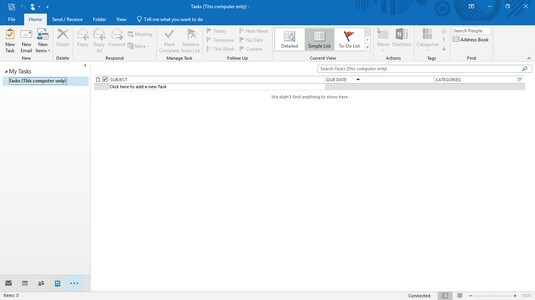 Outlook displays the Tasks view. You can browse through this list of tasks to find the one you want. However, if you have many tasks, you may want to let Outlook search for them instead. Click the Home tab, and then click in the Search To-Do List text box (or press Ctrl+E). The cursor appears in the Search To-Do text box. Type as much data as you can about the task you want to find. 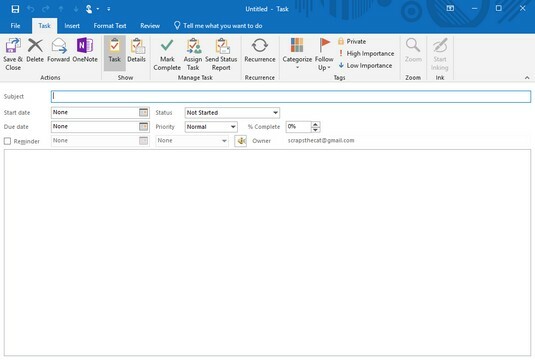 Outlook displays all tasks that match the search criteria that you typed in Step 3. Click the Close icon in the Search text field. Outlook displays all your tasks once more. As you store tasks in Outlook, you’ll have tasks in various levels of completion, tasks involving different people, tasks coming due sooner than others, and tasks associated with certain people. To help you see only certain types of tasks, such as tasks due in the next seven days, Outlook can show different views of your task list. 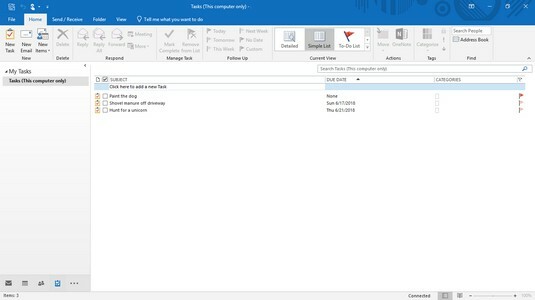 Click Tasks in the bottom-left corner of the Outlook window. In the Current View group, click the More icon. Outlook displays a list of different ways to view your tasks. Click on a view icon such as Next 7 Days or Overdue. Outlook displays all your tasks that meet your chosen criteria. For more detailed information on using Outlook, pick up a copy of Microsoft Outlook 2019 For Dummies.